Most people are familiar with Holocaust Denial — the assertion that the Holocaust is a myth conjured up by the Jews to create sympathy and support for the Jewish people. But few seem to be aware of a similar anti-Semitic concept called "Temple Denial." It is the claim that no Jewish Temple ever existed in Jerusalem on the Temple Mount. This idea circulated among Muslims for many years, but it did not become well known until the year 2000 when Yasser Arafat proclaimed to President Clinton at the Camp David Summit Conference that "Solomon's Temple was not in Jerusalem, but Nablus. "1 This bizarre claim was picked up by the press and was circulated worldwide. Two years later, Arafat again asserted that there was "not a single stone proving that the Temple of Solomon was there [in Jerusalem] because historically the Temple was not in Palestine at all. "2 Then, to everyone's amazement, he claimed it was located in Yemen and that he had personally visited the site! Despite the fact that Arafat was neither an historian or an archaeologist or a student of the Bible, his insane assertion spread like a wild fire across the Muslim world, and since that time, it has become a "fact" in Muslim thinking. 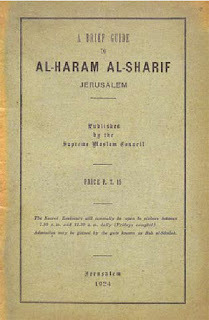 The 1924 Islamic guidebook to the Temple Mount which affirms that the Jewish Temples were located on the Mount. "Al-Haram Al-Sharif" is the Islamic name for the Dome of the Rock. It means, "The Noble Sanctuary." The site [of the Dome of the Rock] is one of the oldest in the world. Its sanctity dates from the earliest (perhaps from pre-historic) times. Its identity with the site of Solomon's Temple is beyond dispute. This, too, is the spot, according to the universal belief, on which David built there an altar unto the Lord, and offered burnt offerings and peace offerings (2 Samuel 24:25). Palestinian President Mahmoud Abbas is both a Holocaust Denier and a Temple Denier. He had this to say about the Jewish Temple: "...they [the Jews] claim that 2,000 years ago they had a Temple. I challenge this assertion that there ever has been a Jewish Temple. But even if so, we do not accept it..."7 How's that for logic? In November of 2014, the PLO's Department of National Affairs issued a warning to journalists not to use the term, "Temple Mount" when describing the site of the Dome of the Rock and the Al-Aqsa Mosque.12 The reason for this demand: "The Al-Aqsa Mosque compound is not a disputed territory and all other terms, therefore, are null and void." 2) The Middle East Media Research Institute (MEMRI) “Interview with Yasir Arafat,” Special Dispatch Series, No. 428, October 11, 2002, www.memri.org/report/en/0/0/0/0/835/743.htm.